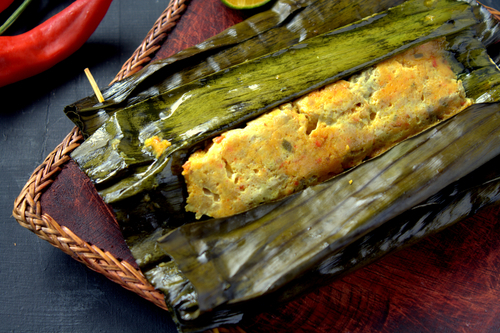 Pepes is an Indonesian cooking method using banana leaf to wrap and prepare food. The banana leaf is non-edible but is used as an organic wrapper. This cooking technique allows the rich spices mixture to be compressed against the main ingredients inside the banana leaf while being cooked. Even the banana leaf gives a certain flavor to the ingredients inside. My favorite is pepes ikan (fish pepes) but sometimes chicken mixed with egg is also used as stuffing instead of fish. In that case the dish is called pepes ayam. Spices used are salt, chili, shallots, garlic, turmeric, ginger, lemongrass, tamarind and lemon basil. The banana leaves are cooked over steam or grilled on charcoal. The dish looks great and the taste is fabulous. Everybody knows the famous nasi goreng, the Indonesian ‘fried rice’, pre-cooked rice that is stir fried and typically spiced with soy sauce, spring onion, garlic, shrimp paste and chili. Egg and chicken will accompany most Nasi goreng dishes. However you should try another kind of nasi goreng with is made with salted sun dried fish fillet and mushrooms. It is called Nasi goring ikan asin. The dried fish gives a salty touch to the rice and makes it really special. It is a perfect dish for lunch. You can easily find it in a local warung while on the road. The above picture was taken at Villa Bossi where our staff makes an excellent Nasi goreng ikan asin! This dish consists of fried pork or pork belly prepared with ketchap manis sauce, a brown sauce made from sweet soy sauce, seasoned with aniseed, ginger and red paprika. 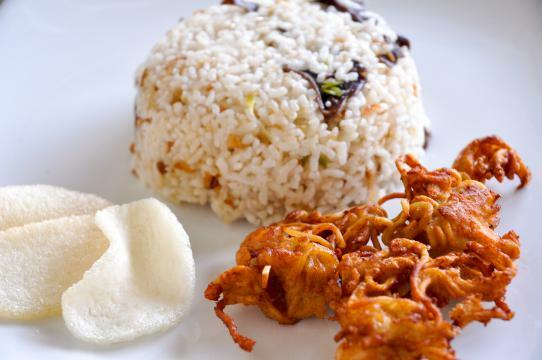 Balinese will eat this traditional dish at festivals such as Galungan and Nyepi. 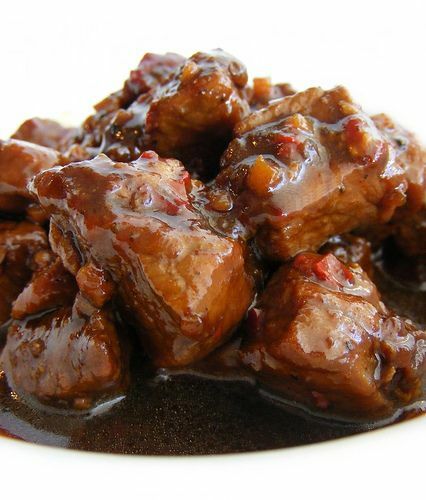 It is somehow similar to the Southern Chinese braised pork in soy sauce but it is sweeter. A must try! This is a great vegetable side dish that will be served at most Balinese meals. 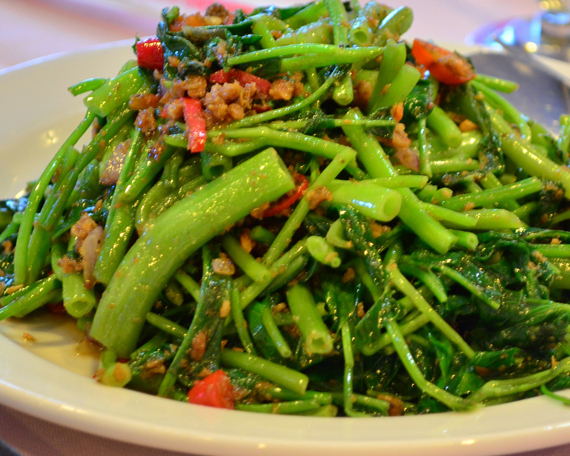 It consists of cooked water spinach prepared with red chili and garlic. 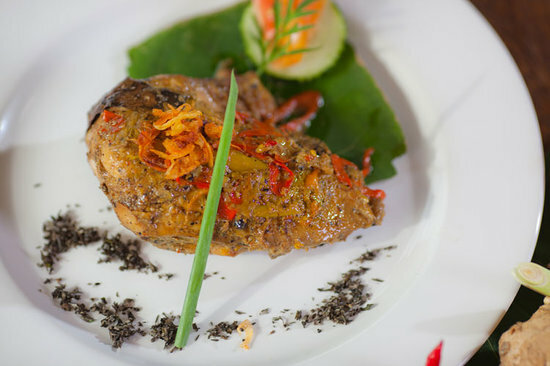 This is a spiced Balinese poultry dish. There are two variants, ayam betutu, made from chicken and Bebek betutu, made from duck. I advise to try the bebek betutu as its taste is richer with spicy seasonings, roasted usually for several hours in banana leaves. The term betutu is the Balinese word for the spice mixture consisting of shallots, garlic, turmeric, ginger, galangal, chili peppers. This spice mix is grounded and mixed with coconut oil to release its aroma. This dish is always served with steamed rice and sambal.